Corrugated panels are translucent laminates consisting of a uniform mat of high strength glass fibers imbedded in organic resin. The resin matrix cures under heat to a solid material which is lightweight, strong, and shatter-resistant; with excellent light diffusion characteristics. Colors are compounded into the resin before cure, thus making the colors as integral part of the composite material. No special tools or skills are needed. Just keep in mind common dimension lumber and standard size panels when laying out your design. (1) Post foots should be approximately 14" deep and 12" across. Set 8" x 3/8" bolt about 3" deep into poured concrete for post anchors. Wood posts may also be secured with 4" angle brackets. Attach 2" x 6" rafter hangers to header, then attach header to house studs with lag screws. (2) Drill posts and set on pins. Toenail crossbeam to post. NOTE: allow 7' 4" from floor to bottom of front header for best ventilation. (3) Pre-notch rafters to compensate for slope. Allow a 1" minimum pitch per foot for adequate drainage. 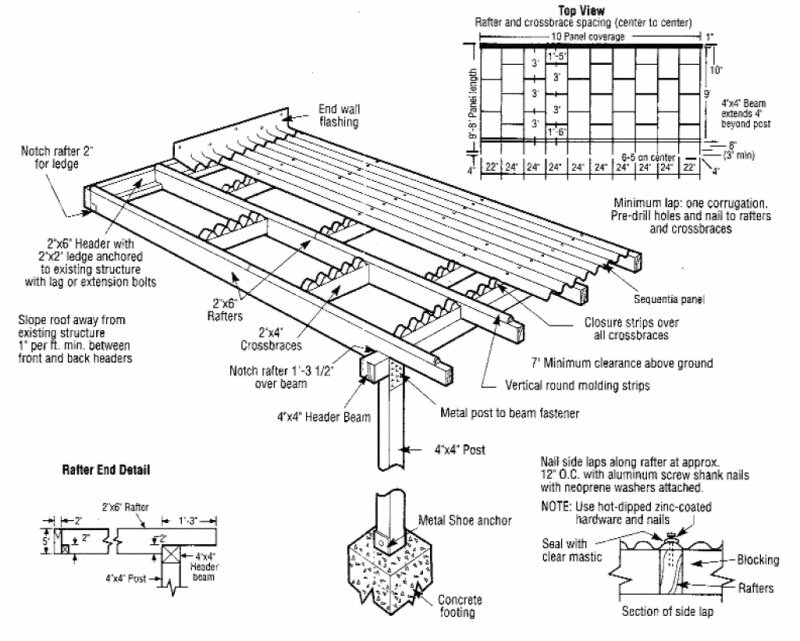 (4) Attach rafters to header and crossbeam with 1" screws and nails. (5) For ease of installation and an attractive design, nail crossbraces between rafters using alternate spacing. Nail round and corrugated molding strips to framing, then paint or stain wood before installing panels. (6) Lay panels on rafters with one corrugation overlap and fasten with aluminum screw nails. Holes should be predrilled. Attach flashing at same time. Find a spot that will give your greenhouse maximum sunshine. Have water handy for sprinkling plants. 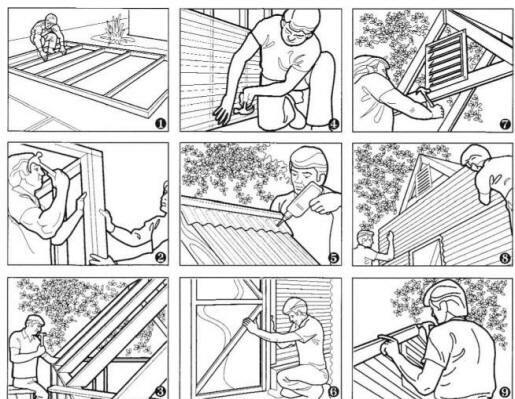 Plan to install fans if you intend to use the greenhouse year-round. Gas and electrical connections should also be considered. Lay patio block for a portable greenhouse or pour concrete footers for a permanent installation. Cut 2 x 4s to proper lengths and nail studs every 24" on center to form front, back and side framing. Nail back and front framework to side frames. Pre-cut roof rafters to desired pitch and nail into position. Pre-drill holes and fasten side panels. Use aluminum nails with neoprene washers and apply mastic to overlap of one corrugation. Overlap roof panels one corrugation (away from prevailing wind) and nail to rafters, starting from one end. Adjust door construction to desired size. Install vent as close to roof peak as possible. Apply front and back panels similarly to side walls. Cut to fit pitch of roof and around vent. Nail trim limber to all corners and to front and back where panels meet roof. Fasten aluminum ridge roll flashing to each panel as you proceed. Apply front and back panels similarly to side walls. Cut to fit pitch of roof and around vent. Nail trim lumber to all corners and to front and back where panels meet roof.